While I was planning my trip to Bali, I saw a beautiful picture of a girl with an elephant. It really looked like it was taken in the forest, in nature, so it really looked perfect for me. I obviously decided to add this place in my bucket list during my trip. But sometimes Instagram isn’t reality and you just know until you’re going. I’ve always dreamed of seen and touching an elephant, they are just so beautiful and majestic! But it’s hard to find a good place that can make that happen without mistreating the animals. But I saw this picture, and I totally fell in love. 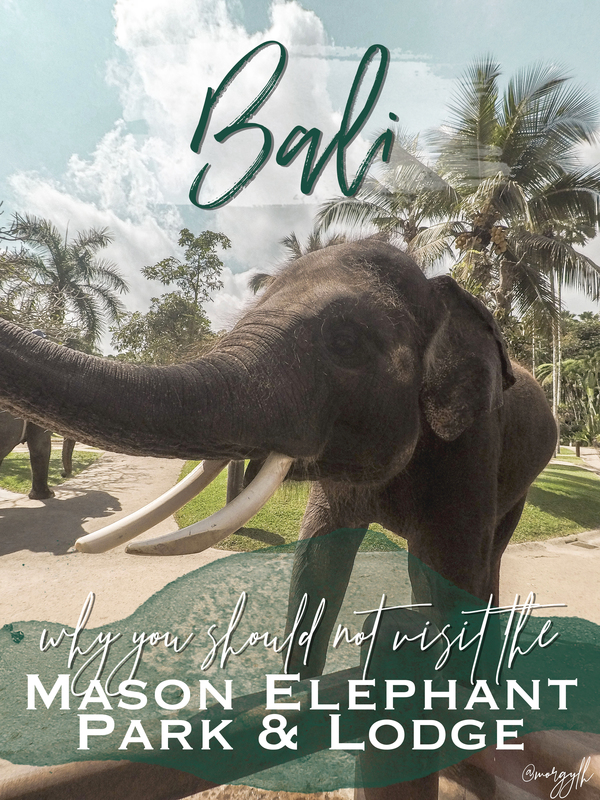 The Mason Elephant Park is supposed to a refuge for Sumatran elephants, they “save” them and take of them in the park. It really look wild and that the elephant is free, in the forest. So then I looked a little on their page to see what the park looks like and if the animals were well treated. And I discover that we can see the elephants in the water and play with them, that we can bathe them, and no pictures of elephant ride, so it looked perfect on “paper”. Ok maybe not -like this- like this, but you know what I mean, it looks so gorgeous. First of all, just the admission is 330 000 IDR for adults, where you can just touch and feed the elephants (still sounds cool right? ), and then it goes up to 1M IDR if you want to bathe them or swim with them. And then for each activities, you can choose with ride or without. Or you also have the safari ride, which looks like a 10 minutes ride.. So just seeing that, I was disappointed because I never saw that they were doing rides, they don’t show that (at least on their Instagram, my bad for not looking closely to the website). And then the prices !!! Totally feels like a tourists trap if you want to bathe them. But I was so happy to meet some elephants, so we went inside. And I saw a little poster (next to the toilets so don’t very seeable) where they were explaining how they train the elephants, and they also talked about the rides. I am not sure it’s really good for them as they don’t have people on their back in their natural habitat but they’re still healthy. We went into a little space to follow an “introduction about elephants”. They talked about their elephants, that they rescued them from Sumatra, explain to us the “anatomy of elephants”, and they did some tricks like smashing a coconut and eating it, painting, and splashing water at us “for good luck”. And then in the park we finally see some elephants from close, I was so happy. So we saw one elephant in the water, and then 5 elephants in line behind a little fence where we could feed them (50K to get a snack for them…). It didn’t feel right but my excitement was too intense, so I went close to them and started to touch them and pet them slowly. And then I saw that the elephant was crying before and I could still see the tears on his face. He wasn’t happy. But all the tourists were, because they are doing tricks like giving you a kiss or standing their trunk. And then I got close to the last elephant on the left, he was beautiful with long ivory tusk, and when I started to touch him, he just ran away, he was tired of all this. But the trainer forced him to come back every time (just by the voice but still, he didn’t want to let him go). It really broke my heart.. So I left to go explore more of the park, because at this price I hope that’s not just that. And that was it, I just had access to that. I think that day, almost everyone else got an elephant ride. And they think they’re helping the elephants, or they just don’t care.. So they have access to the “safari area” where they do the rides. So in the end, it was just a small park with a huge pool, and some fence all around to see and touch the elephants. IT WAS NOTHING LIKE THE PICTURES!!! No elephants in the forest where we can get close and gently touch them. No no no, it was a huge park, a huge tourists trap where people spend a lot of money to encourage that behavior. They put some ideas that it’s okay to ride elephants when it’s not, and people are stupid enough, or just selfish that they don’t care and trust those lies. No it’s not okay to ride them in Thailand but in Indonesia it’s good, it’s exercice for them ? Please! I wasn’t even mad at the Indonesians, maybe it’s in their culture (even if it’s still not okay), but I am madder at the tourists that come from more educated countries and are still doing this without any regrets.. And I am not even talking about the bloggers that are promoting this place.. Like did you even take a look around you or you just got your picture and leave ? So please, if you are going to Bali even if it’s a dream to see elephants, don’t do it that way..
It’s not just because you don’t ride them that it’s okay. If you’re going you’re still encouraging them, and this type of behavior, I was so sad to see all those tourists who didn’t care, please don’t be like them.